Launched for the first time in 2002, the “Africa e Mediterraneo for Best Unpublished Comic Strip by African Author” has been until its last edition – completed in 2015 – one of the most important comics award for African artists and the only one open to comics artists who come from all over Africa. The award aimed at promoting the work of African cartoonists in Europe, both to the general public and to experts, enables them to enter the international market. The activities involved in the project had the further aim of making the European public aware of the issue of inter-cultural exchange through the art of comics, a medium that facilitates immediate communication. 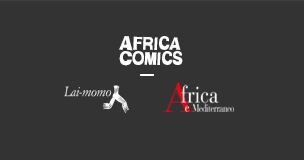 Over the space a decade we compiled 6 editions of the Africa e Mediterraneo Award and published 5 catalogues collecting some of the most fascinating and relevant comics published in each of the 6 editions. The catalogues can be bought directly on Lai-momo’s website. Mendozza Y Caramba (Ivory Coast), AAAAA! Jo Palmer (Togo), On a fumé Malrobo!